The launch phase of the mission will see a Falcon 9 deliver TESS into a lunar transfer orbit, sending the craft to a precise point when the moon’s gravity will grab TESS and fling it out into a farther orbit than it’s initially launched into. At 350 kg (772 lb), TESS is the lightest-known payload to have ever launched on a Falcon 9. After lifting off from SLC-40 at the Cape Canaveral Air Force Station, FL, the Falcon 9 will fly due east from the pad. The first stage, after 2 minutes 29 seconds of powered flight, will separate from the second stage and perform a landing on the Of Course I Still Love You drone ship in the Atlantic. For the launch, after stage separation, the second stage will continue to fire its single MVac (vacuum optimized Merlin engine) until SECO-1 (Stage Engine Cut Off -1) at 8minutes 22 seconds into flight. This will be followed by a 32 minute 33 second coast of the stage and TESS before the second stage engine re-starts for a burn to send TESS into a Lunar Transfer Orbit. Shortly after SECO-2, TESS will separate from the top of the Falcon 9 second stage at 48 minutes 42 seconds after launch having been placed into a super synchronous transfer orbit of 200 x 270,000 km (124 x 167,770 mi). The second stage will then perform a third burn to inject itself into a disposal hyperbolic (Earth-escape) orbit. 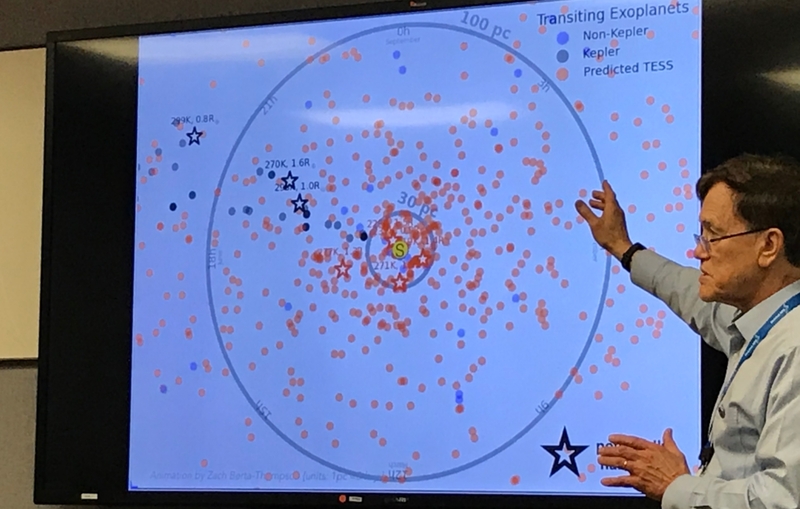 Over the first five days, TESS’s control teams will check out the overall health of the spacecraft before activating TESS’s science instruments 7-8 days after launch. TESS will then perform a final lunar flyby on 16 May – one month after launch, a lunar gravity assist which will change the the craft’s orbital inclination to send it into its 13.7 day, 108,000 x 373,000 km (67,000 x 232,000 mi) science orbit of Earth – an orbit that is in perfect 2:1 resonance with the moon. 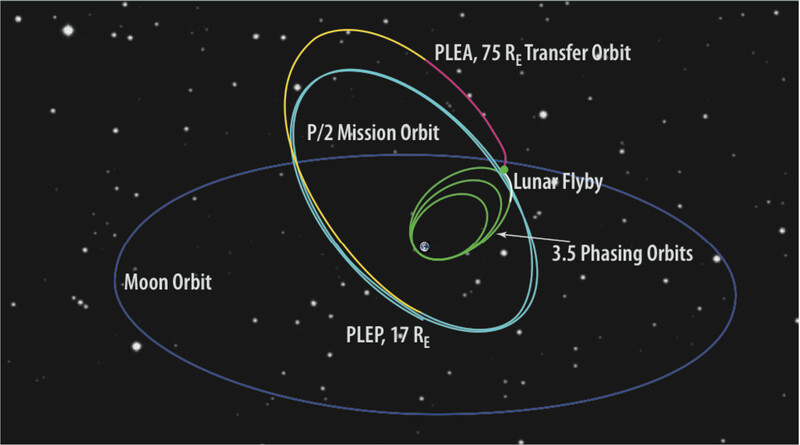 The maneuvers and encounters Leading to the final TESS orbit. PLEA and PLEP are the post lunar-encounter-apogee and perigee, respectively. Credit Ricker et al. 2015. Moreover, this orbit will provide TESS with unobstructed views of both the Northern and Southern Hemispheres. For almost all of its orbit, TESS will be in data gathering mode, only transmitting its stored data to Earth once per orbit during the three hours of its closest approach to Earth, or perigee. Assuming an on-time launch, TESS will enter operations on 12 June. Overall, TESS has daily launch opportunities from 16-21 April, no launch opportunity on the 22nd (per NASA documentation), and then daily opportunities again from 23-26 April. There is no opportunity on 22 April because the amount of time between the consecutive daily opportunities on 21 and 23 April is just slightly longer than 24 hours, thus barely skipping over all times on the 22nd. 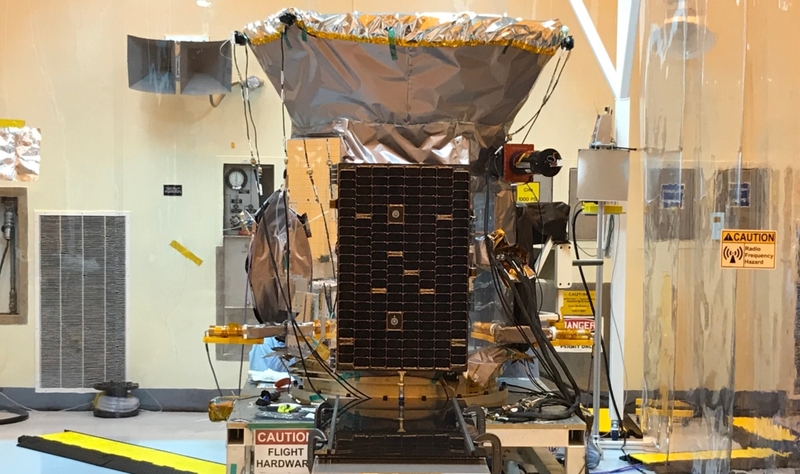 However, if for some reason TESS is not off the ground by 26 April, the exoplanet hunter must stand down launch operations so that NASA’s Launch Services Provider (LSP) group can shift gears to support the agency’s InSight mission launch to Mars from Vandenberg Air Force Base, California. The LSP does not have a large enough staff to support two missions from both coasts, and since InSight has a short interplanetary launch window it must launch within, InSight would get priority over TESS. After InSight, TESS has additional launch opportunities in both May and June.